Antimicrobial resistance had in the last decades emerged as a health issue, but only in the last couple of years has there been an understanding that we are facing a “global societal challenge and threat.” On a day-to-day basis, people worldwide are said to be driving resistance across human health and agriculture. 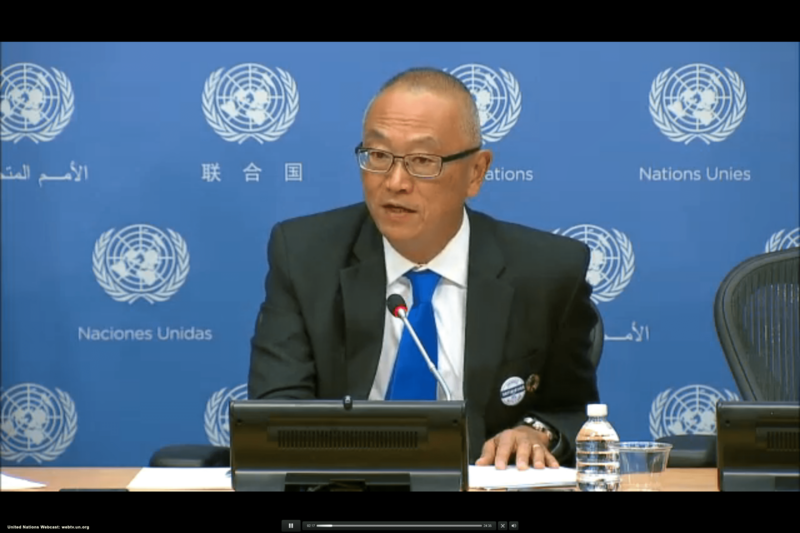 During a press conference in New York yesterday ahead of next week’s UN General Assembly, Special Representative for Antimicrobial Resistance and Assistant Director-General of the World Health Organization, Dr Keiji Fukuda, gave a broad overview of the issue of antimicrobial resistance and why the UN General Assembly will be taking up the issue during its 71st session. A High-level meeting on antimicrobial resistance will be convened by the President of the General Assembly, the World Health Organization, the Food and Agriculture Organization and the World Organisation for Animal Health on 21 September. Antimicrobial resistance (AMR) is the resistance of a microorganism to an antimicrobial drug that was originally effective for treatment of infections caused by it. In his opening remarks, Fukuda placed the scope of the AMR issue on the same level as big global issues such as the emergence of HIV and climate change, which have dramatic implications for individuals and countries. Therefore, next’s week high-level meeting “would be apropos for an issue of this magnitude” he said. Fukuda pointed out that around the world, we are losing the ability to simply treat infections, as they are becoming resistant to antimicrobial drugs and antibiotics, noting also that this was not an esoteric issue but one affecting everyday infections to major communicable diseases such as HIV and tuberculosis. In the last century, death rates decreased as poverty was reduced, water sanitation and food supplies improved, and health interventions such as vaccines and antibiotics came into being, placing us in an era of treating chronic disease, explained Fukuda. But “the emergence of AMR really threatens to send us backwards,” he warned, citing that for example, by 2050 more people will die from antibiotic-resistant infections than currently die from cancer. In parallel, Fukuda stated that the economic cost, both from having to take care of people infected and the loss of lives, particularly of young people and their contributions through adulthood, would be 100 trillion dollars cumulatively by 2050. This, according to Fukuda, amounts to 2-3.5 percent of the global GDP. Modern agriculture is another aspect to take into account and along with sustainable food production, largely depends on antibiotics. With 7 billion people in the world, the need for food is going be an “enormous pressure,” Fukuda said. When taken together: “the impact of very large numbers of people dying, … the erosion of healthcare and the eroding ability to keep up with food supply” and enormous economic costs, “all of a sudden begin to really threaten the ability to continue with development as we’re aspiring to do, particularly the Sustainable Development Goals,” he concluded. In turn, as these factors constitute the basis for development and are now being put at risk, discussions by people in different sectors and organisations are now also growing. For example, a G20 communiqué noted AMR as a threat to economic development. Similarly, in the next week the World Bank will issue a report on the impact of AMR and its anticipated economic consequences. Fukuda outlined three points to be sought at next week’s high-level meeting. One is for heads of state to provide visible signs that they understand the scope of the issue and are committed to address it. Secondly, that in the face of a global issue, resources, financial support and the engagement of multiple sectors are required. Thirdly, concrete discussion on the coordination among different organisations and sectors would also be needed. Fukuda added that the latter two should be facilitated by heads of state. As the floor was opened for questions, the Inter Press Service asked Fukuda what he hopes to see next week and what the root causes of AMR are. In response, Fukuda recounted that the Global Action Plan adopted at the World Health Assembly in 2015 provided a technical blueprint. Next week’s meeting can enable this plan to go forward, he said. Therefore, the most fundamental thing to do now is to raise awareness, he urged. Another cause that needed to be addressed was the lack of development of new antibiotics. Companies had lost incentives to make new medicines and therefore ways would have to be found to make this area attractive again for the private sector to have R&D on a sustainable basis. Larger issues in this area also involve the attainment of quality healthcare and access. What has gotten attention though are certain forms of resistance developing in one place and moving to another. Consequently, Fukuda recommended that focus will be needed on outbreaks and the emergence of infectious diseases and how to make it harder for resistance to spread around the world. The webcast of the press conference can be found here. "Antimicrobial Resistance A ‘Global Societal Challenge And Threat’, WHO Official Says" by Intellectual Property Watch is licensed under a Creative Commons Attribution-NonCommercial-ShareAlike 4.0 International License.